Reid, Monty. "Royal Tyrrell Museum of Palaeontology". The Canadian Encyclopedia, 18 May 2018, Historica Canada. 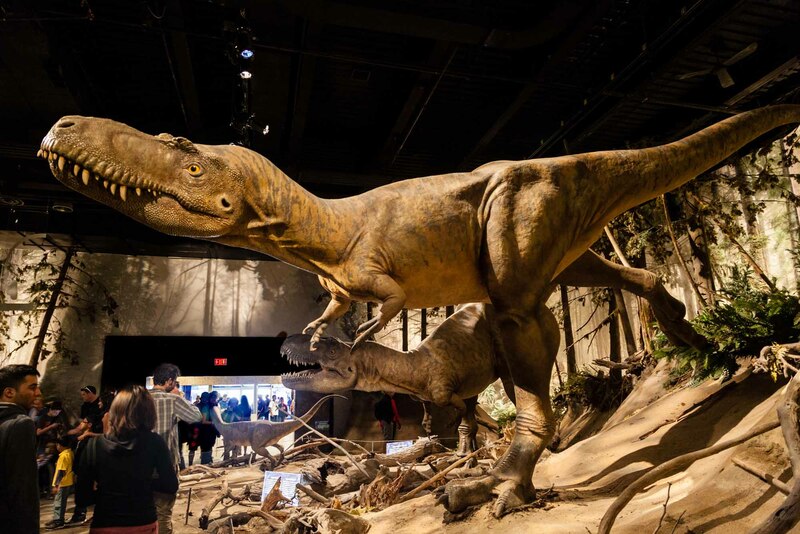 https://www.thecanadianencyclopedia.ca/en/article/royal-tyrrell-museum-of-palaeontology. Accessed 24 April 2019.
in the Tyrrell's 4,400 square metres of display space celebrate 3.5 billion years of life on Earth. More than 800 fossils are on permanent display. They include some of the largest land animals the world has known. More than 30 dinosaur specimens can be seen in the main gallery. The skeleton of Albertosaurus standing over Centaurus, shown in a display at the Tyrrell Museum (courtesy Royal Tyrrell Museum of Palaeontology). This museum is the only one in Canada devoted to the study of prehistoric life (photo by Roy Odoms/Take Stock). 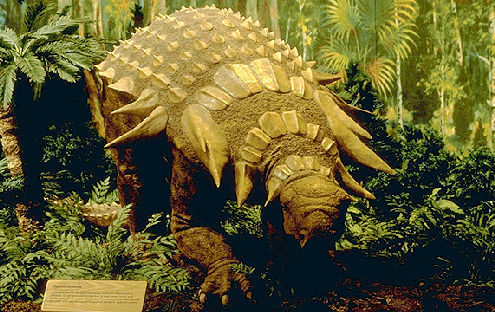 Edmontonia (shown in a display at the Tyrrell Museum) was an armoured, plant-eating dinosaur (courtesy Royal Tyrrell Museum of Palaeontology). Royal Tyrrell Museum of Palaeontology, located in the badlands along the Red Deer River near Drumheller, Alberta, is Canada's only museum dedicated solely to the study and display of prehistoric life. It is named after surveyor and explorer Joseph Burr Tyrrell, who discovered dinosaur remains near the present museum site in 1884. The provincially funded facility had a capital cost of $30 million. It opened to the public on 25 Sept 1985, and was bestowed the title Royal by Queen Elizabeth II on 28 June 1990.
in the Tyrrell's 4,400 square metres of display space celebrate 3.5 billion years of life on Earth. More than 800 fossils are on permanent display. They include some of the largest land animals the world has known. 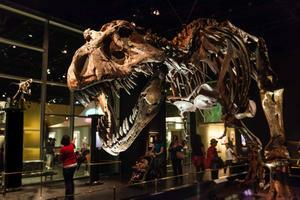 More than 30 dinosaur specimens can be seen in the main gallery. Included are skeletal reconstructions of large meat-eaters such as Tyrannosaurus rex and Albertosaurus, along with plant-eaters such as Triceratops and Camarasaurus. A grouping of duckbill dinosaurs includes babies, a nest of eggs, a juvenile and full-grown adults. Lifesize models of 4 dinosaurs known to have lived in Alberta some 65 million years ago can be found within the museum galleries and in outdoor exhibits. 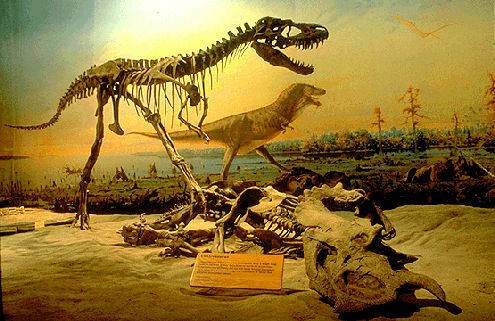 Videos, computers and other audio-visual programs provide information on the collection of fossils, continental drift, dinosaur extinction and other topics. A large window enables visitors to watch as fossils are being prepared in the museum's well-equipped preparation laboratory. Other features include a fully enclosed prehistoric garden, interactive science experiments and guided hikes in the surrounding badlands. A wide range of public programs includes participation in dinosaur excavations and fossil preparation. Annual visitation averages 450 000. 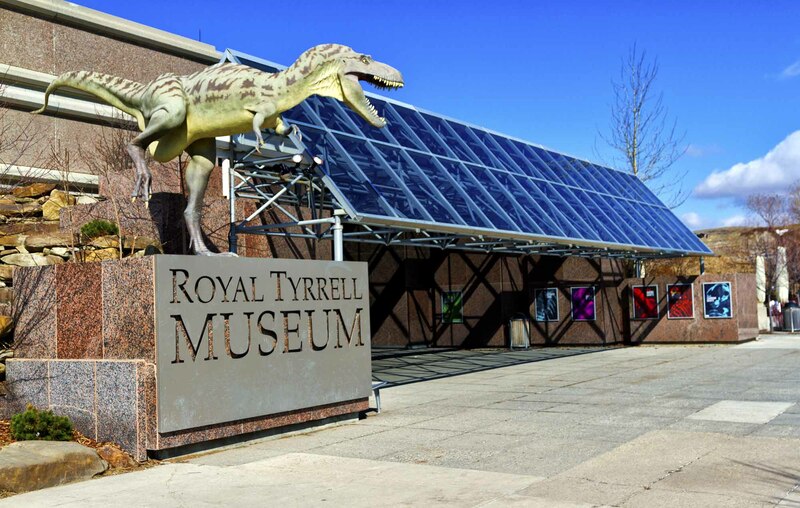 The Royal Tyrrell Museum operates an intensive collection and research program in palaeontology. New specimens are found each year in nearby Dinosaur Provincial Park, where the museum operates its satellite field station. The 500 square-metre field station (opened May 1987) houses displays of dinosaurs and other fossils found in the park. Further afield, the Tyrrell has participated in expeditions to South Africa, the Canadian Arctic and the Gobi Desert. Original research is conducted in vertebrate palaeontology, invertebrate palaeontology, palaeobotany and sedimentology. 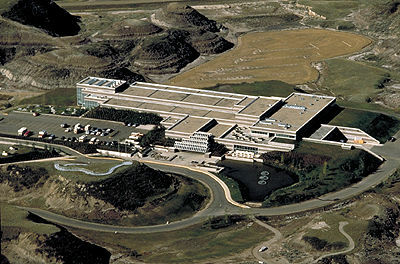 The museum research group is formally associated with the Universities of Calgary and Alberta. More than 200 000 specimens now reside in the museum's collection.